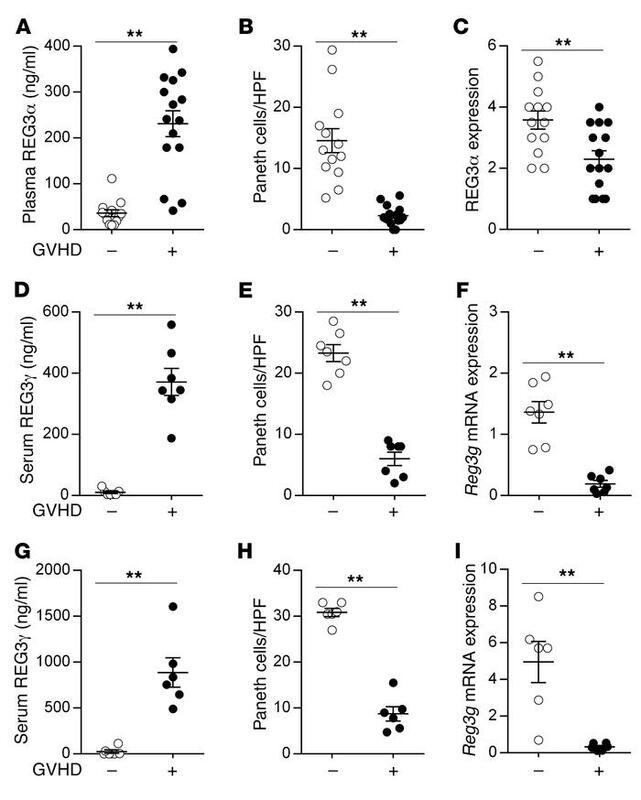 REG3α/γ levels in the plasma/serum and intestinal mucosa during GVHD. (A–C) Samples were collected from 28 allogeneic BMT patients without GVHD (white circles, n = 13) and with GVHD (black circles, n = 15). (A) Plasma concentrations of REG3α measured by ELISA. (B) Average Paneth cell numbers per high-power field (HPF) in the same biopsies. (C) Semiquantitative REG3α expression in the duodenum. (D–F) B6 mice underwent BMT from syngeneic B6-Ly5.1 donors (GVHD –, white circles, n = 7) or allogeneic C3H.SW donors (GVHD +, black circles, n = 7), and samples were analyzed on day +7 after BMT. (D) Serum REG3γ levels measured by ELISA. (E) Average Paneth cell numbers per HPF in ileal tissue from the same mice. (F) Ileal tissue Reg3g mRNA expression measured by quantitative PCR (qPCR). (G–I) B6D2F1 mice underwent BMT from syngeneic B6D2F1 donors (GVHD –, white circles, n = 6) or allogeneic B6 donors (GVHD +, black circles, n = 6), and samples were analyzed as before on day +7 after BMT. (G) Serum REG3γ levels. (H) Average Paneth cell numbers per HPF in ileal tissue. (I) Ileal tissue Reg3g mRNA expression. **P < 0.01, unpaired 2-tailed t test. Data are expressed as mean ± SEM.